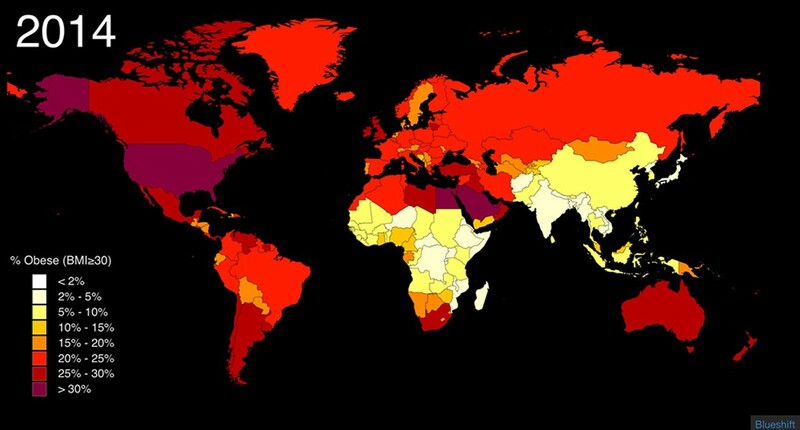 By Max Galka, Blueshift Comparison of global obesity rates in 1975 and 2014. Right about the time the U.S. government issued its first dietary guidelines in 1980, obesity and its evil twin, Type 2 diabetes, took off. In 1950, 12 percent of us were obese; 30 years later, that figure had increased marginally to 15 percent. But between 1980 and 2000, the rate shot up to 35 percent. 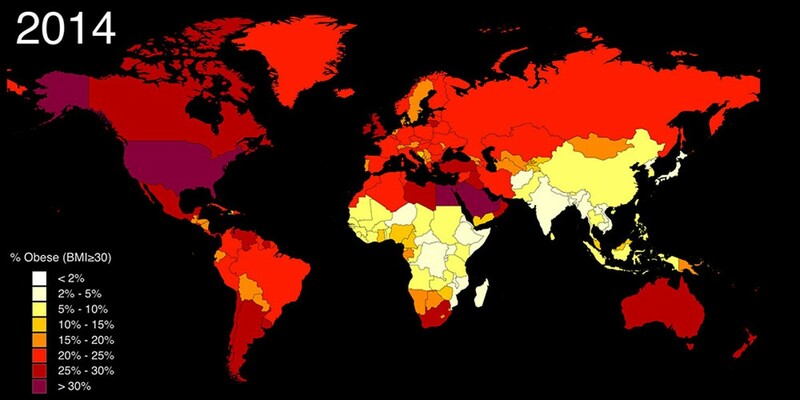 Today 160 million of us, 13 percent of the total overweight and obese people in the world, live in a country that only accounts for 5 percent of the global population. What happened? Why, despite the guidelines, did we get fat? A chorus of well-researched books and articles is now reevaluating the government's advice. It looks like we got fat not despite but because of the guidelines. In 1980, we were told to avoid saturated fats and cholesterol, which for many Americans meant cutting back on meat, butter, eggs and whole milk. Suddenly pasta, rice, margarine and low-fat milk were considered healthier than the fat-laden stuff we'd previously been eating. Turns out, the guidelines were tragically wrong, as were our own instincts, which caused us to link the noun fat (in food) with the adjective fat (a fat person). Ingesting fat doesn't make us fat; our bodies don't just passively funnel bacon straight onto our thighs. Same with cholesterol. Dietary cholesterol doesn't equate to blood cholesterol, whatever your doctor tells you (a recent study found that 54 percent of U.S. doctors do believe that); most people can eat several eggs a day without affecting their blood cholesterol levels. That's because the complicated chemical factories we call "bodies" automatically produce less cholesterol when we ingest more of the stuff. Still not convinced that fat isn't the problem? Oxford University published a study in 2008 showing an inverse correlation between saturated fat and heart disease in Europe. 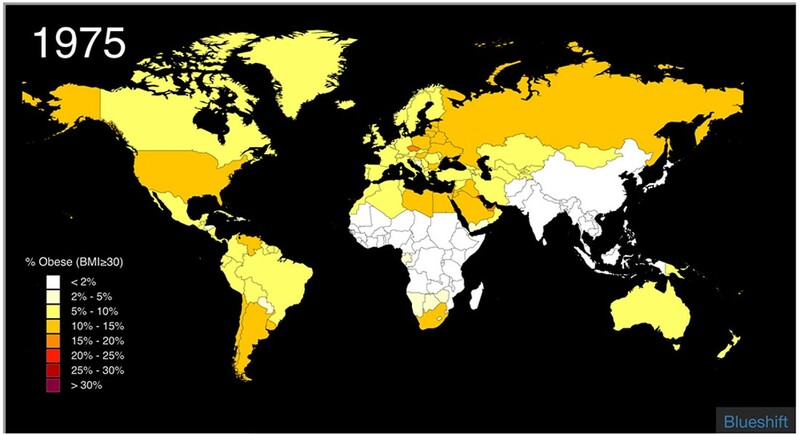 France scores highest for eating saturated fat and lowest for heart disease, while the Ukraine has the lowest intake of saturated fat and the highest rate of heart disease. So if fat isn't the problem, what is? Probably sugar. Just about every week new evidence links sugar (not fat!) with obesity, Type 2 diabetes, heart disease and some types of cancers. Alzheimer's often gets a mention there, too. From our bodies' point of view, straight-up carbohydrates in the form of refined sugar (absent fiber and nutrients) came as a shock a mere 300 years ago, and they're still trying to figure it out. Meanwhile we've been nourishing ourselves with fatty meat just about forever. It's possible to thrive without meat (my wife and I have been doing so for nearly 40 years) but replacing it with easily-digested carbohydrates — as was the effect of the 1980 guidelines — isn't the solution. The government seems to be finally getting the message. Last year, it published new dietary guidelines, calling for us to obtain no more than 10 percent of our calories from sugar (still too high, in my opinion) with nothing said about cutting back on meat. Forty-seven years ago, we followed government guidelines and got fat and unhealthy. Hopefully this time around they've got it right. Bon appétit! Barry Evans vows never to say again, "A calorie is a calorie is a calorie."